Now that Simon Kinberg has been confirmed to write and direct X-Men: Dark Phoenix, the cast is starting to come together. Canadian actor Lamar Johnson, best known for playing West on the hit Canadian TV series The Next Step, has signed on for the superhero follow-up, which will take place in the 1990s. 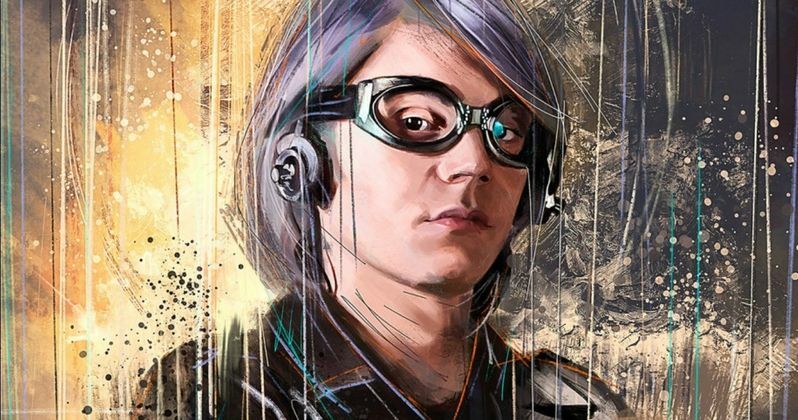 It has also been confirmed that Evan Peters will return as Quicksilver, reprising his role from 2014's X-Men: Days of Future Past and last year's X-Men: Apocalypse. The Hollywood Reporter broke this casting news this week, although they couldn't confirm what character Lamar Johnson is playing. This comes just a few days after an unconfirmed report claiming actress Jessica Chastain is in talks to play the primary villain, Shi'ar Empress Lilandra, but there hasn't been any confirmation that she has officially signed on to join the cast yet. There have even been rumors that Angelina Jolie was being sought for another mystery role, but that wasn't confirmed either. Returning to reprise their roles from X-Men: First Class, X-Men: Days of Future Past and X-Men: Apocalypse are Jennifer Lawrence (Mystique), Michael Fassbender (Magneto), James McAvoy (Professor X) and Nicholas Hoult (Beast). Also returning from X-Men: Apocalypse are Sophie Turner (Jean Grey), Alexandra Shipp (Storm), Tye Sheridan (Cyclops) and Kodi Smit-McPhee (Nightcrawler), with this story adapted from an important comic book arc that was previously tackled in the 2006 movie X-Men: The Last Stand, which many thought was not up to the standards set from the first two movies. When X-Men: Days of Future Past eradicated the entire original trilogy from the timeline, the stage was set to reboot the Dark Phoenix saga, with the cast from the X-Men prequel trilogy. The Dark Phoenix saga centers on Jean Grey, showing how she becomes host of the Phoenix Force, which turns her into a powerful and entirely destructive mutant. No other characters have been confirmed yet, but leaked audition tapes hinted that the production was re-casting the Rogue character, portrayed by Anna Paquin in the first X-Men trilogy. Since this story is set in the 1990s, before the original X-Men trilogy took place, it would make sense to re-cast this character, but it remains uncertain whether or not casting is still under way for this role. There have also been rumors that the mutant Dazzler will be introduced, a pop star who was referenced in a X-Men: Apocalypse deleted scene. There has been talk that Taylor Swift may be up for the role, although it is said to be a small one. 20th Century Fox has set a November 2, 2018 release date for X-Men: Dark Phoenix, which will be the third X-Men movie released that year. First up is The New Mutants on April 13, 2018, followed by the highly-anticipated sequel Deadpool 2 on June 1, 2018 and then X-Men: Dark Phoenix. Aside from his role as Quicksilver, Evan Peters is best known for starring in all six seasons of American Horror Story, and he is expected to return for the seventh season as well. He is currently filming American Animals alongside Ann Dowd and Blake Jenner. Lamar Johnson will next be seen in on the big screen in Kings, alongside Daniel Craig and Halle Berry.